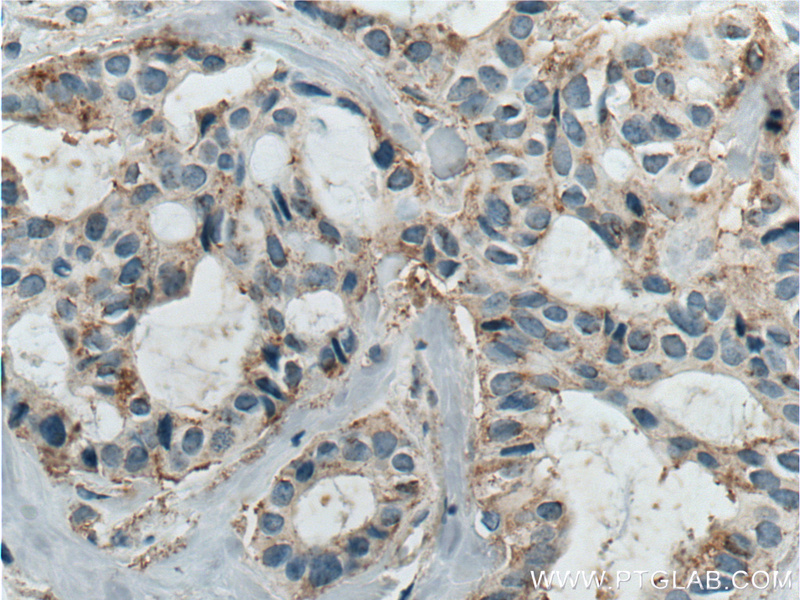 Immunohistochemistry of paraffin-embedded human breast cancer tissue slide using 10121-2-AP( ICAM2 antibody) at dilution of 1:200 (under 10x lens) heat mediated antigen retrieved with Tris-EDTA buffer(pH9). 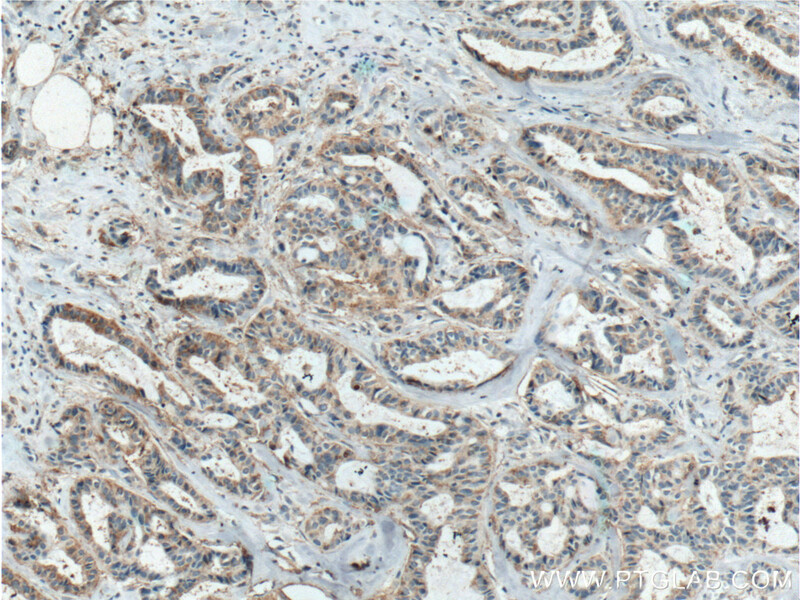 Immunohistochemistry of paraffin-embedded human breast cancer tissue slide using 10121-2-AP( ICAM2 antibody) at dilution of 1:200 (under 40x lens) heat mediated antigen retrieved with Tris-EDTA buffer(pH9). ICAM2 is a cell adhesion protein having important roles in cell migration, especially during inflammation when leukocytes cross the endothelium. Initially described as a receptor for lymphocyte function-associated antigen-1 (LFA1), ICAM2 may play a role in lymphocyte recirculation by blocking LFA-1-dependent cell adhesion. It mediates adhesive interactions important for antigen-specific immune response, NK-cell mediated clearance, lymphocyte recirculation, and other cellular interactions important for immune response and surveillance. ICAM2 has six N-linked glycosylation sites at amino acids (asparagines) 47, 82, 105, 153, 178 and 187. This antibody got 55-80 kDa in western blotting maybe due to glycosylation. ICAM-2 expression mediates a membrane-actin link, confers a nonmetastatic phenotype and reflects favorable tumor stage or histology in neuroblastoma. Intercellular adhesion molecule 1/2 and E-selectin in plasma cell mastitis: immunohistochemical study of 35 cases. 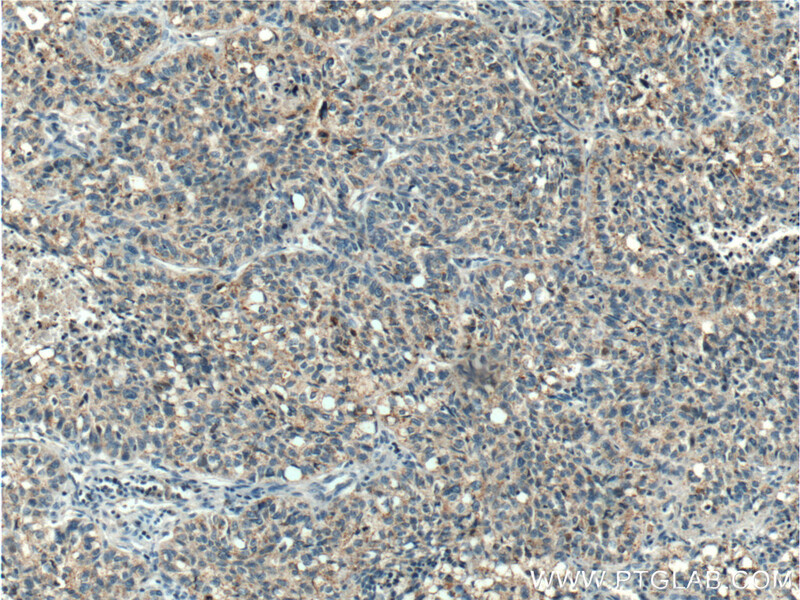 Immunohistochemistry of paraffin-embedded human lung cancer tissue slide using 10121-2-AP( ICAM2 antibody) at dilution of 1:200 (under 10x lens) heat mediated antigen retrieved with Tris-EDTA buffer(pH9). 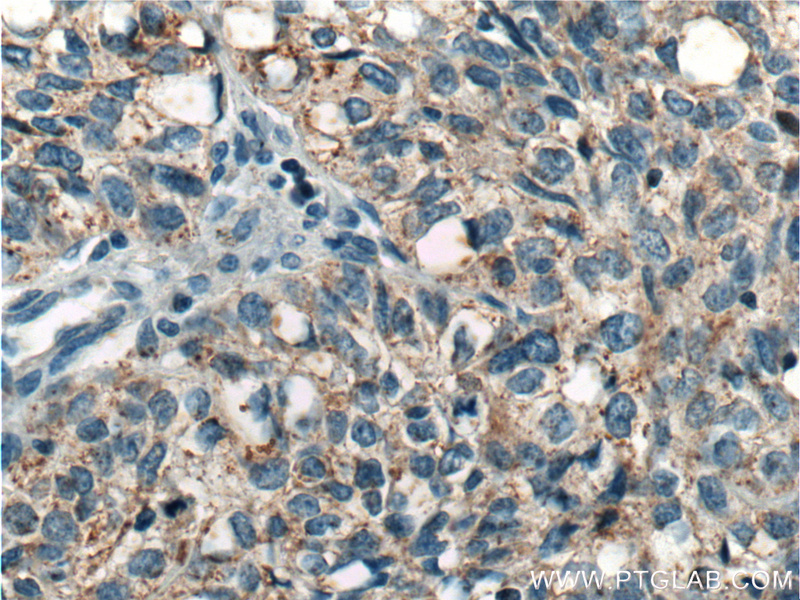 Immunohistochemistry of paraffin-embedded human lung cancer tissue slide using 10121-2-AP( ICAM2 antibody) at dilution of 1:200 (under 40x lens) heat mediated antigen retrieved with Tris-EDTA buffer(pH9).